Enkosi Offers Tooling from Desoutter Industrial Power Tools and Accessories | Enkosi Pty. Ltd.
It’s difficult to go overboard when detailing the amount of effort that goes into industrial tooling quality. This is simply one of those disciplines that can’t be over exaggerated, not in terms of productivity excellence and fabrication integrity. Enough with the superlatives, though, for we’re about to deliver the facts. Today, while introducing Desoutter Industrial Tools, let’s talk about exemplary tooling attributes. Not too many manual tools can match the speed and versatility of a power tool. Sure, older tools didn’t need a long electrical cord, but neither does a contemporary power tool. 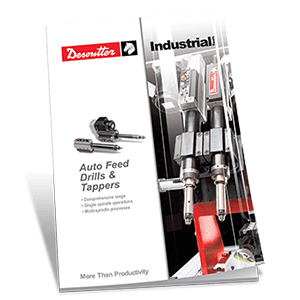 For example, an ergonomically designed Desoutter drill is a handheld pneumatic tool with multiple output spindles available. Like a powered toolbox in the hand, these high-power instruments take drilling performance to the next level. Of course, we’re referring to a relatively advanced tool, but it’s not a machine that sits at the top of its category. In order to reach that lofty realm, we need to look at Desoutter’s Advanced Drilling Units, the tools that combined with accessory packs are able to drill, ream and countersink incredibly accurate holes. It’s difficult to describe an industrial tooling solution if the user has never seen this level of refined fabrication work in motion. Imagine a humble screw or bolt, a series of fasteners that are tightened by a regular screwdriver or wrench. In the light commercial domain, the fastener is secured when the user says it’s tight. Subsequently, one of those fasteners could be inserted with a crossed thread, or perhaps the opening would be so irregularly shaped that the bolt head protrudes from the fixed surface. Industrial applications just can’t afford that kind of installation leniency, which is why professionally-graded tooling systems exist. Keep those inadequacies in mind as we turn to uncompromising industrial situations. An aircraft component, for instance, is drilled with absolutely aligned openings, so the advanced power drilling unit requires an accessory that assures perpendicular aperture cutting. Similarly, the fastener systems must engage the bolt and screw heads, fasten the rivets, and tighten all threaded assets with a fractionally controlled torque feature, something only an adept tooling vendor could guarantee. In order to establish this degree of tooling assurance, a power implement reliability factor that surpasses all other solutions, Enkosi offers tooling from Desoutter Industrial Power Tools, a technology partner who can deliver a manufacturing solution that satisfies any quality assurance strategy. Pneumatic or electric, accessory or power tool, the Desoutter difference, as endorsed by Enkosi, promises absolutely precise parts assemblage.